Monmouth’s full-time, 95-credit physician assistant (PA) graduate program will give you the rigorous, hands-on learning environment you need to become a critical part of the changing healthcare landscape. 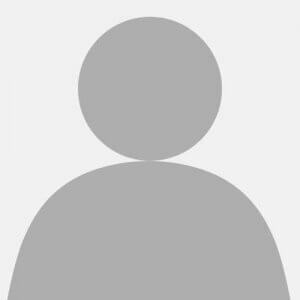 As a PA, you will be a licensed medical professional and an important solution to the looming problem of healthcare access, especially as aging Baby Boomers and those newly insured by the healthcare reform need more care. 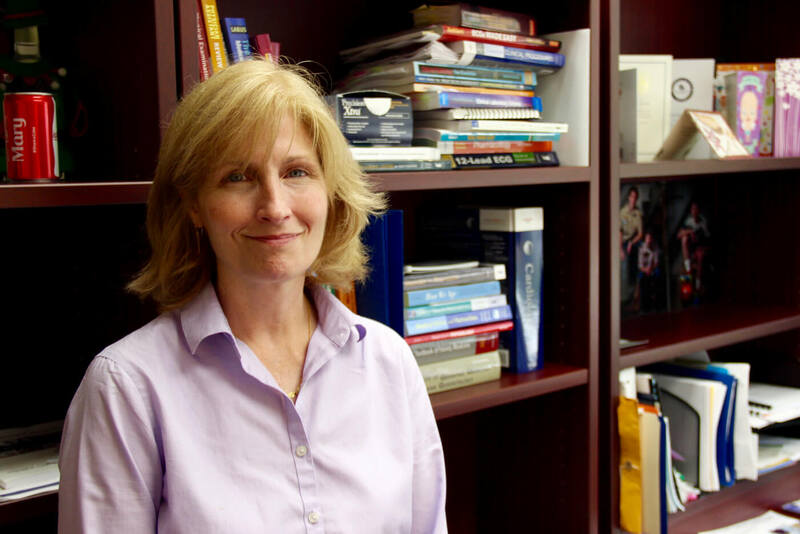 One cohort of students enrolls each fall and advances through the 36-month program together, giving you a team of up to 30 student colleagues who can share insights and support. 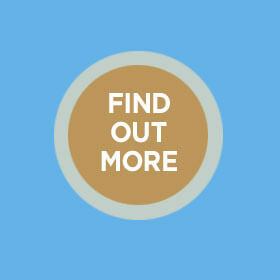 Monmouth’s broad-based curriculum will give you the foundation you need to practice in any specialty. 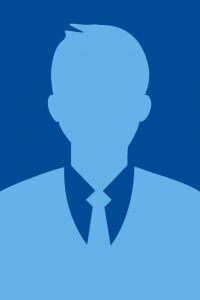 Experienced, highly skilled faculty will give you the personalized attention you need to excel. Rigorous classroom instruction is combined with extensive work in clinical settings in Monmouth’s physician assistant program. The program consists of a didactic phase and a clinical phase. The 42-week didactic phase includes classroom and clinical skills laboratory instruction, with hospital and clinic experiences. In the 64-week clinical phase, you will participate in clinical clerkships, where you will be assigned to preceptors at various hospitals and physician offices. 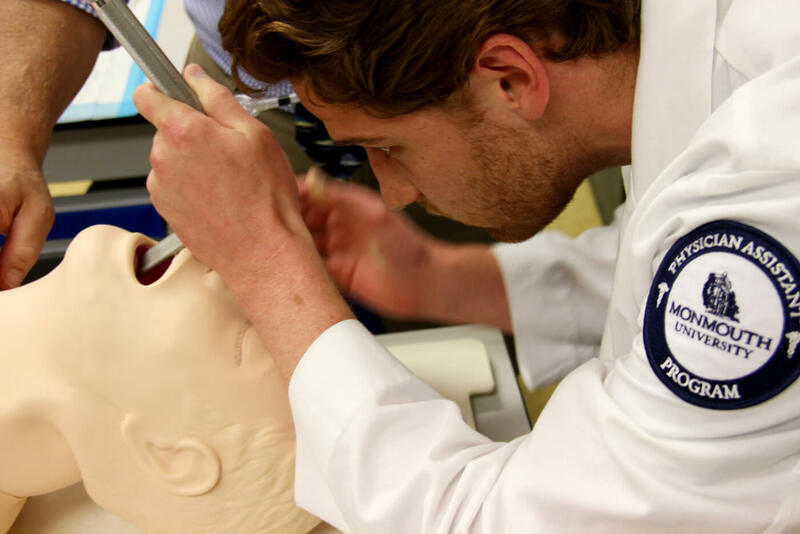 Physician Assistant Student Erik Woxholdt is practicing endotracheal intubation on the PA Program's simulation model enhancing his clinical skills. 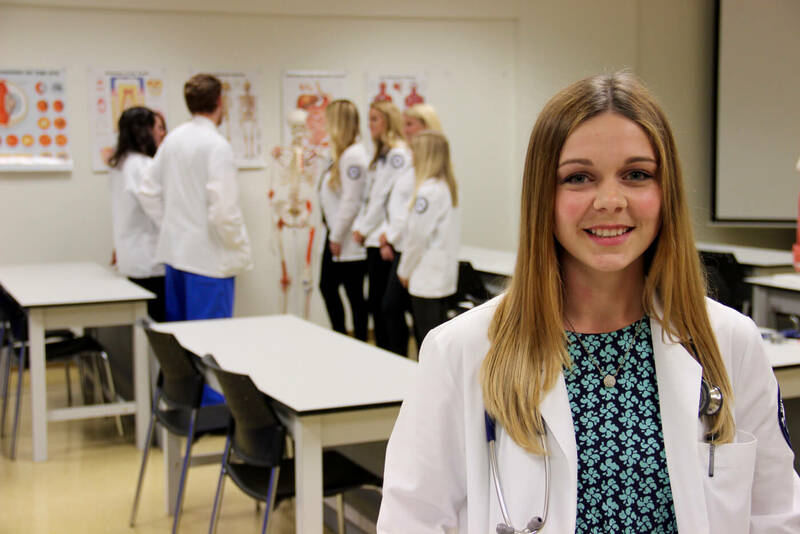 Simulation exercises prepare students for their clinical clerkships. 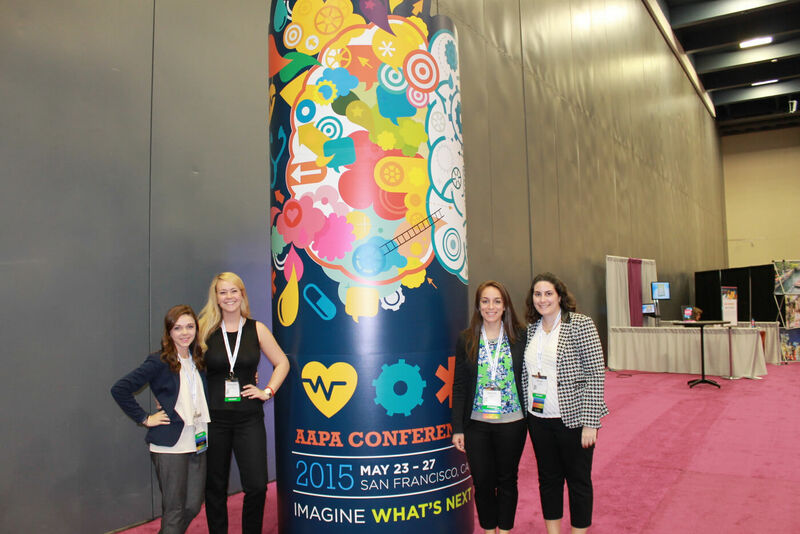 In May 2015, members from the executive board of the Monmouth University Physician Assistant Student Society attended the AAPA conference held in San Francisco, Ca. The annual conference in held to help physician assistants discover tools that will take their career to the next level, elevate their thinking with the latest medical innovations and experience it all with 6,000 of their peers. Pictured (left to right): Nikie McCabe, Genevieve Daly, Deanna Lapp, Nicole Lupo, class of 2017. 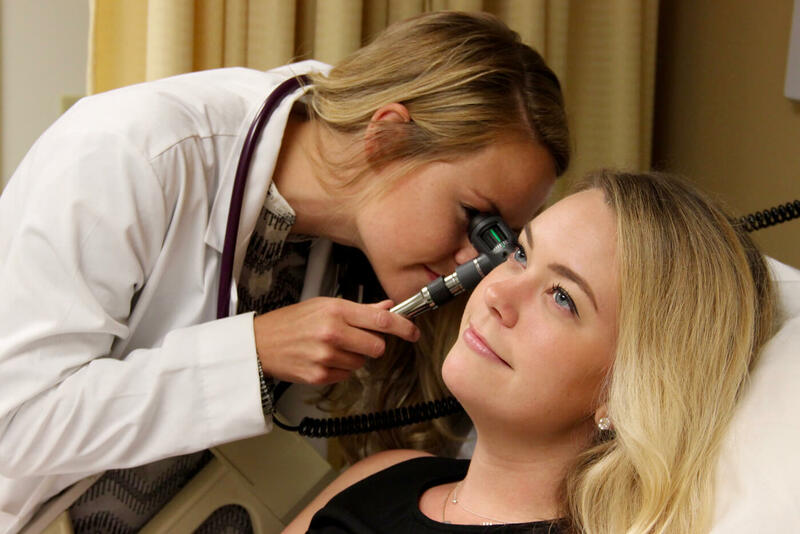 Physician Assistant student Kaitlyn Clay uses an otoscope in the PA Program's clinical skills lab to look in the ear of fellow student Genevieve Daly. Our clinical skills laboratory gives students many opportunities to learn essential patient care procedures for their clinical clerkships and future careers. To apply to our physician assistant (PA) program, you must submit an application online through the Central Application Service for Physician Assistants (CASPA). When applying through CASPA, simply select Monmouth University from the list of schools, and your completed application will then be sent to our admission office. Any applications sent directly to Monmouth University will not be considered. Students must graduate from an accredited program in order to be eligible to sit for the Physician Assistant National Certifying Examination (PANCE). 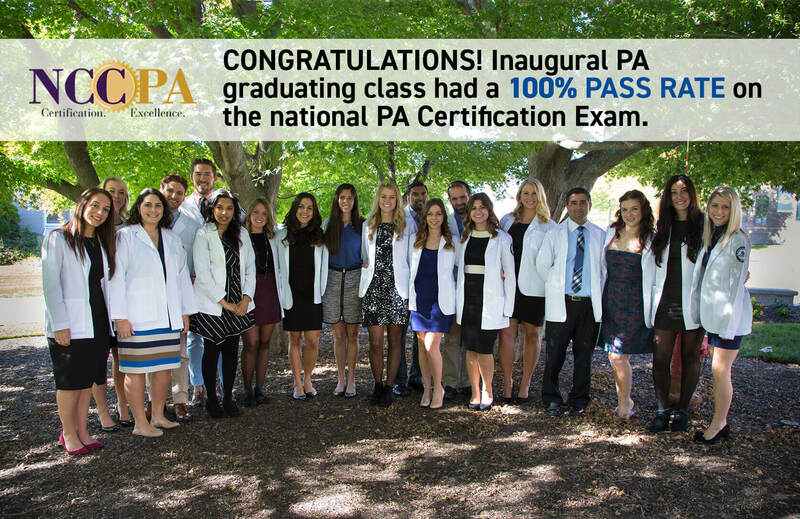 Achieving a passing score on the PANCE allows a PA to use the designation Physician Assistant-Certified (PA-C). 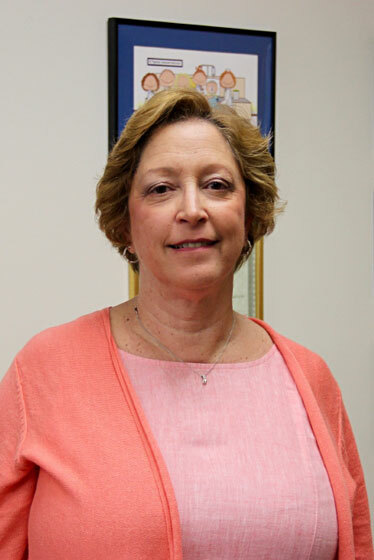 Mary H. Stern (PA-C, M.Ed., Specialist Professor, Physician Assistant Program) has worked in family practice, neonatology, pediatric cardiology, and employee health. 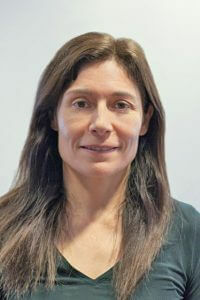 She recently utilized her pediatric cardiology skills when she traveled to Guatemala to assist in an Intensive Care Unit. 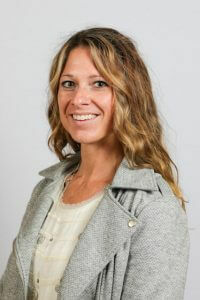 Dr. Carol Biscardi's (PA-C, Ph.D.) clinical experience is in the areas of general surgery and pediatrics. 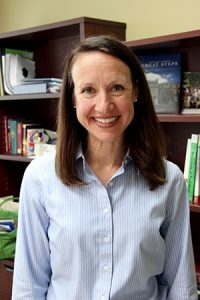 She has worked in pharmaceutical clinical drug research, been a full-time PA educator for over 25 years and more than a decade of experience as a program director. 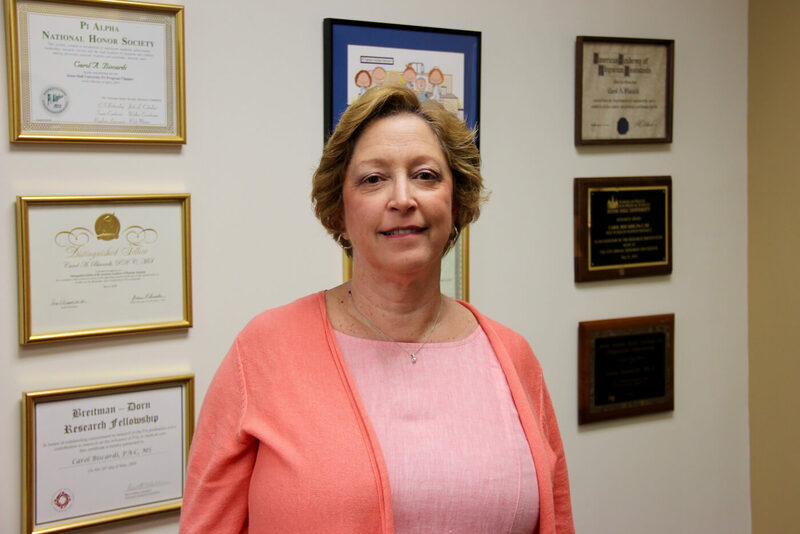 She uses her wealth of knowledge to prepare future clinicians via the Physician Assistant program at Monmouth. As demand for skilled healthcare practitioners grows, there’s never been a better time to be a physician’s assistant. This lucrative, versatile career lets you work with patients in a variety of settings. At its March 2017 meeting, the Accreditation Review Commission on Education for the Physician Assistant (ARC-PA) placed the Monmouth University Physician Assistant program sponsored by Monmouth University on Accreditation-Probation status until its next review in March 2019.